Yarn and Fiber Happenings: Fall in Love with the Hydrangea Shawl and Fluffy Fun Fur Arrives! Fall in Love with the Hydrangea Shawl and Fluffy Fun Fur Arrives! 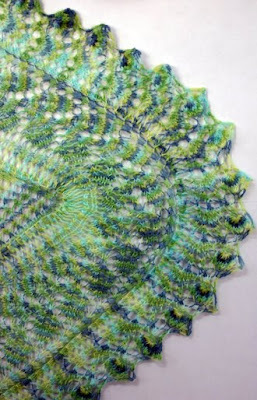 Fall in love with the Hydrangea lace shawl project that is quick, easy and breathtaking! The Hydrangea Shawl is a beautiful and easy lace shawl featuring a unique and beautiful border. Made from just one skein of Ivy Brambles Romantica lace weight yarn this shawl is lightweight and lovely. 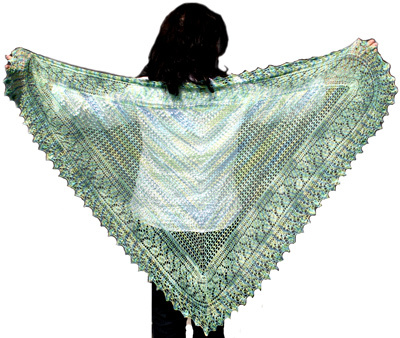 This shawl starts at the top and builds with a center spine to keep you on track. When the center triangle is complete, borders add to the beauty with simple lace patterning that create elegant trailing leaves which finish to flowers growing to the edges. Like fluffy projects! We have some furry fun for you! Now in, Fun Fur for your quick to knit or crochet projects! Adults and kids alike, fell in love with Fun Fur scarves a few years ago.... look no further, we have the best variegated colorways for you! Get some today and whip up some fun furry happiness for someone you love! Only two skeins makes a fun and fluffy scarf to wear all year long! Live in the Providence, Rhode Island area? The Yarn and Fiber Company will have a booth at the Machine Quilters Exposition, MQX East 2011 on April 14 - 16th! Come by and see our beautiful garments in person as well as stock up your favorite yarns and other wonderful, creative items!